Two suspected drug dealers and their alleged buyer, a barangay tanod (village watchman), were allegedly caught in possession of 104 small sachets of shabu during an anti-drug operation in Panglao on Friday. 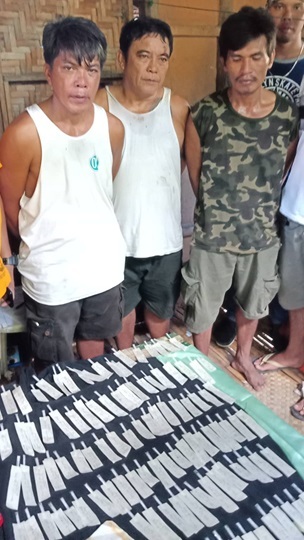 The suspects identified as Rolando Guibone, 49, Rowel Clapiz, 38, and barangay tanod Nestor Babatuan, 50, were apprehended in a drug buy-bust operation in Barangay Poblacion at 10:30 a.m.
Police said that the operation was set against Guibone after he was allegedly spotted selling illegal drugs near his residence earlier on the same day. Guibone transacted with a police poseur-buyer but it was Clapiz who handed over the shabu to the undercover officer. Police then arrested both alleged drug dealers and Babatuan who was with the suspects during the operation. Authorities said that they found 21 sachets of suspected shabu in Guibone’s possession, 30 with Clapiz and 53 with Babatuan. According to police, the seized drugs were estimated to be worth P82,000.